Yes, I had to throw in a little Game of Thrones reference there. It’s a prominent issue for any gardener though! With Winter coming we need to get our gardens ready for the colder weather and all the elements. Get rid of those dead plants, plant bulbs ready for Spring and give the garden that general tidy up. I love being in the garden and learning what to do over the seasons is really interesting. If you want to make your garden look lush and full of colour come Spring, you need to get the bulbs in between October and December. They need to be planted before the first frost too. I order m bulbs from Gardening Direct. They stock some of my favourites: fritillarias, grape hyacinths, tulips, crocus, and daffodils. They also have Evergreens which create a bit of colour for the Winter months too. One good way of using everything in the garden, especially after Autumn, is to make a kind of compost with the fallen leaves, leaf mould. We get plenty of them from the fruit trees in the garden. The leaf mould is a little different to compost as all the leaves do not decompose. Put aside a large container, or area in the garden and let the leaves do what they do. When it has decomposed, spread the leaf mould over the bare soil. It could be a very good organic mulch. I love lawns that look perfectly tendered too. My grandma has the perfect grass in her gardens. To revitalise your lawn, it is a great idea to get rid of all of the old grass clippings and moss first. There are various tools you can use for this. Make deep holes with the prongs on a fork on areas that are more worn than others. Autumn lawn feed is a great way of preparing your lawn for the winter months too. Firstly, make sure you have adequate and protective clothing on when gardening in harsh conditions. Like the clothing from Englebert Strauss, they have garments for all weather conditions and are fashionable too! When it snows, it can be a blessing or not. Depending on what plant you are. The snow covering a bulb bed can be a great thing as the snow protects it, like a layer of wood chippings. A useful tip for tall Evergreen trees is to get the snow off the bottom branches, then work your way up the tree. The snow on the branches can weigh the tree’s down and cause breakages. If you have any great tips for getting the garden ready for Winter, then please do follow me on social media @mummyconstant, or comment below. 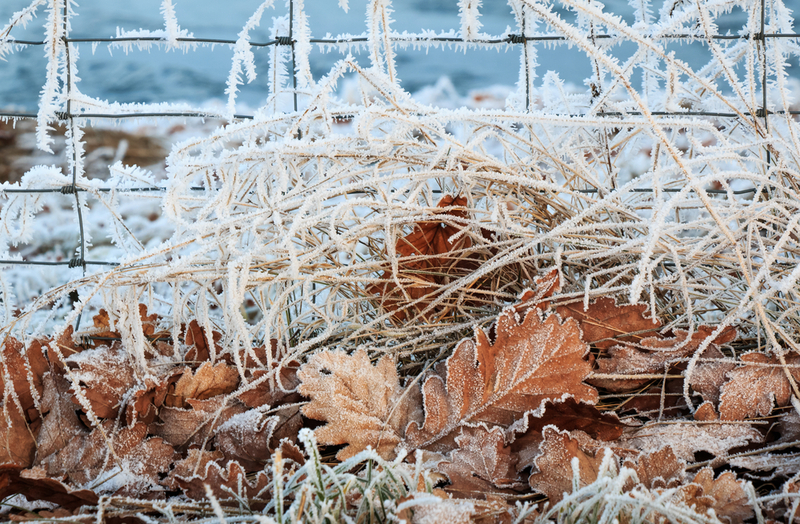 Frozen garden image by ShutterStock.